The Tzar has assigned you, the humble village blacksmith, a suicide mission to recover a variety of magical artifacts. Fail, and he will cut off your head. Yaga follows your journey, based on the choices you make, for better or worse. Yaga, from Breadcrumbs Interactive, is an action RPG set in a fourteenth-century Eastern European setting, but one populated by the creatures of the Slavic myth and religion. Players take on the role of Ivan, a village blacksmith who has been down on his luck — despite his overwhelming talent — since losing his hand to a mythical beast. While the cost was dear, his survival has put him squarely in the sights of the greedy Tzar, whose thirst for treasure is insatiable. Unknown to Ivan, he’s also in the sights of Baba Yaga and her coven, who control and define his fate and journey all while trying to protect the magic of the lands from the Tzar. Each crossroads in the hero’s journey is offered as a choice, with three witches each presenting an option for the next step in the journey. 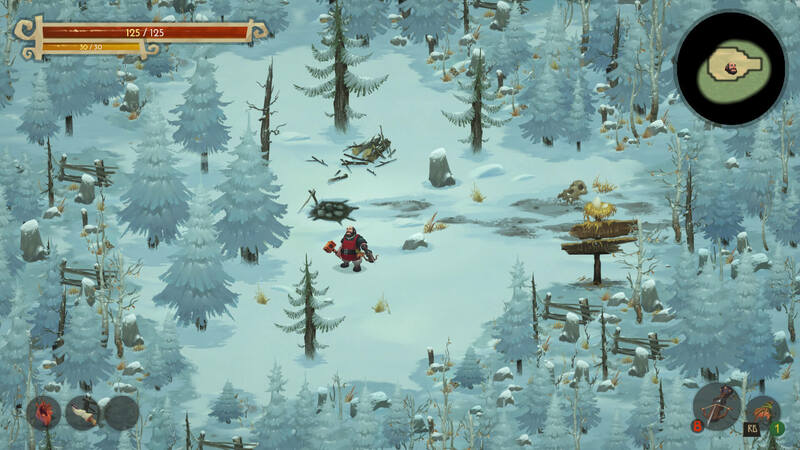 Yaga spends most of its time as an action RPG, with Ivan slashing and smashing his way through droves of different enemies. There’s plenty of variety to be found in the game’s weapons; the build I played at the Nordic Game Conference earlier in the year was already loaded with half a dozen. I very quickly settled on a grappling hook which latched onto enemies, stunning them while rapidly moving creatures on the battlefield. The aRPG sections I played were short, five-minute jaunts around procedurally generated areas. Each featured small quests and challenges, which is where one of Yaga’s more interesting elements come into play: reputation. During my exploration of the forest — and Ivan’s home village — I was given a lot of choice when it came to interacting with other humans. Theft and violence were always options and, based on the strength and size of Ivan, few could stop him. But negotiation, compassion and concessions were also on the table — and the reputation of a kindly, charitable person is surely much better than that of a callous thief? Yaga doesn’t care much for morals, instead adapting to suit your playstyle; the aggressive thug will spend more time fighting, while kinder players will help and learn from the mythical creatures of the woods and swamps. In addition to all of this, being a blacksmith, Ivan can craft and upgrade weapons to a massive degree. Magic comes into play as well, giving you the chance to enhance and modify weapons beyond normal thresholds. Villagers and mystical beasts can also cast curses or charms on Ivan, depending on his actions. Yaga is set to release in the near future, with its release currently planned for PC, Mac, Linux and Xbox One. Nintendo Switch and PS4 releases are planned, should the game receive enough support.